The last time I ate a Ploughman's in a pub was after an energetic bike ride (mostly uphill) near The White Horse at Uffington, in Wiltshire. I was never so grateful to see a plate full of food (I don't do well on bikes). There was paté, lettuce, cheese and ham. And pickled onions, a tomato and some crusty bread to help it all along. And as I cast my mind back to that balmy May afternoon, I thought to myself: why not stuff it all into one sandwich? It would save on washing up. And it's easier to eat. And portable. A winner, surely. 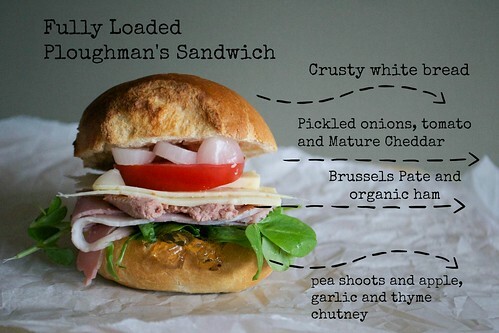 There's paté and ham - the peppery, creamy paté contrasting with the Organic, thick-cut unsmoked ham. And then add your favourite Cheddar - I opted here for a rich, mature Davidstow Cheddar, hacked into crumbly slices. I've also used Apple, Roasted Garlic and Thyme jelly - to give a sweetness and replace the apple that's so often served alongside a good Ploughman's. The crusty bread roll is a must - somehow a soft, floury bun just wasn't chewy and sturdy enough. And you get a different, more intense and toasty flavour with a crusty roll, anyway. The pea shoots are there as a nod to our gorgeous British summers - and then of course there's a tomato slice for moisture and a sliced pickled onion. 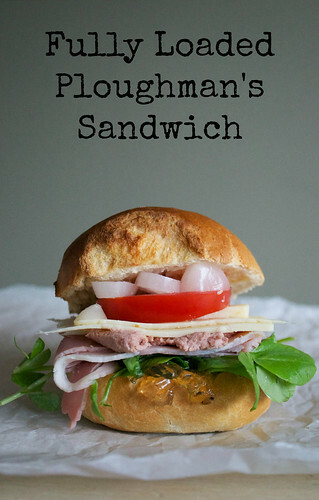 Because it just wouldn't be a Ploughman's without it.